60 FPS is Modern Warfare 3's "Competitive Edge"
Sledgehammer Games General Manager Glen Schofield says Modern Warfare 3's ability to run at 60 frames per second gives it a distinct edge over the competition because if you're not running at 60, you might as well not be running at all. The war of petty zings between Activision and EA over the modern battlefield genre continued today in an AusGamers interview with Glen Schofield, formerly of EA's Visceral Games and who now heads Activision's Sledgehammer Games studio. Sledgehammer is currently assisting Infinity Ward in the development of Modern Warfare 3, which naturally means that Schofield was obligated to take a potshot or two at the looming Battlefield 3 - or, more precisely, the anonymous "competition." "We really re-vamped this engine. We put a whole new audio system in and it is as competitive as anybody out there," he said, responding to a question about the impressive Frostbite 2 engine powering Battlefield 3. "You can go out and name your engine and call it whatever you want, right. You know, I've done that before; I've seen that trick and the bottom line is, [Modern Warfare 3] will run at 60 frames a second. Not sure any of our competitors will." Schofield's comments come off more than a little similar to remarks made by Activision CEO Bobby Kotick, who implied at E3 that Battlefield 3 is "just a PC title." Developer DICE confirmed earlier this month that the console versions of the game will run at 30 FPS with a 720p resolution but said it was a worthwhile trade-off for better overall gameplay. "We think huge levels, lots of players, great effects, destruction, vehicles & varied gameplay are more important than 1080p," DICE Rendering Architect Johan Andersson said on Twitter [via Eurogamer]. "How is that a shame? Name a single FPS game that runs at 1080p on any of the consoles? [We] would have to do huge gameplay cuts." It's quite possible that I'm looking at this from the wrong angle but as a long-time PC gamer I'm used to tweaking various visual settings in a quest to find the sweet spot between smooth frame rates and eye-punching visuals, and it's my experience that frame rate ain't everything. More is better but if you can shave a little off the top in exchange for a few more explosions, a shower of bullet casings and blood spatter on the walls that lasts forever, and still keep things nice and smooth, I'd call it a worthwhile compromise. And I think that a slavish devotion to frame rate and resolution can ultimately be a bit counter-productive. Still, that seems to be the peg upon which Schofield is hanging the Modern Warfare 3 hat. "Not sure I've seen any of our competitors on the console especially running at 60 frames a second and I'd be a little scared at this point - in June - if I was looking forward to a particular game that wasn't on the console and running at 60," he said. "And I think 60 is our competitive edge and you just don't throw that away." 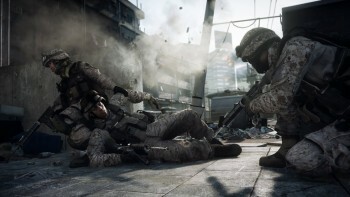 Battlefield 3 comes out on October 25 for the PC, PlayStation 3 and Xbox 360. Modern Warfare 3 follows closely behind, arriving on November 8 for the same platforms.